Every once in a while you come across someone who just looks like a person who had an interesting life story. 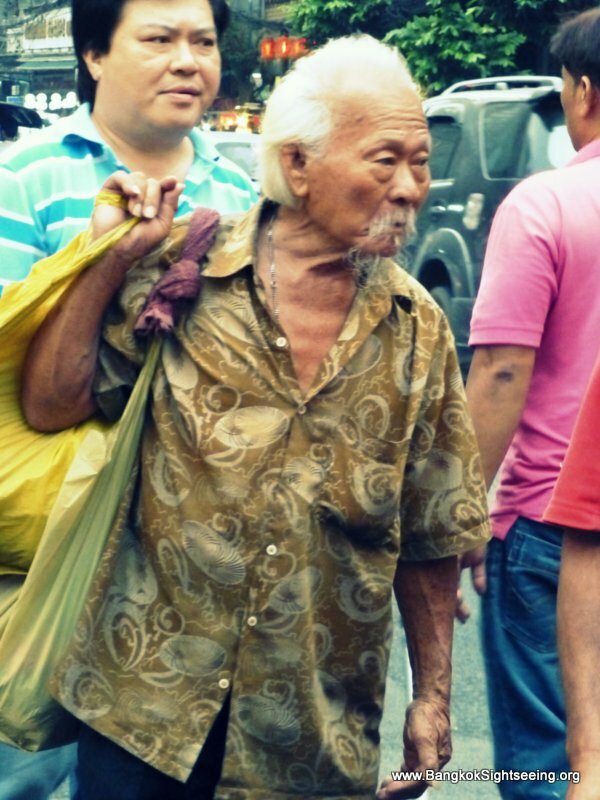 How about this old Asian man with his thick white hair andhis long white beard? 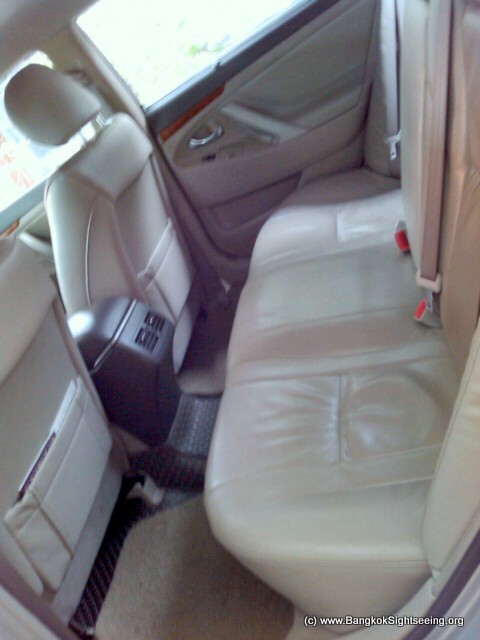 Looking for Transfer from Bangkok to Pattaya? 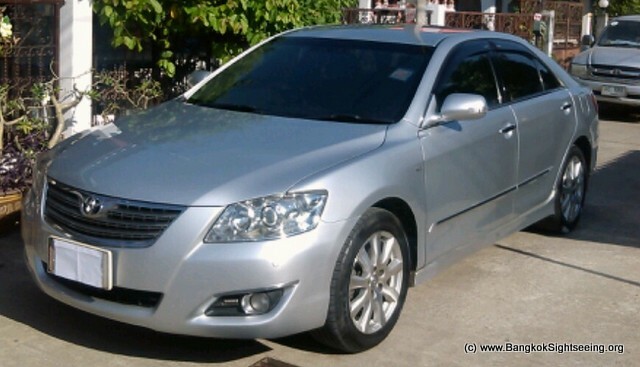 There are many companies that offer a transfer from Bangkok to Pattaya, and you will sure be able to find something cheaper if you look a bit more. The cheapest way to go to Pattaya fast is to simply get on a public van from Victory Monument. 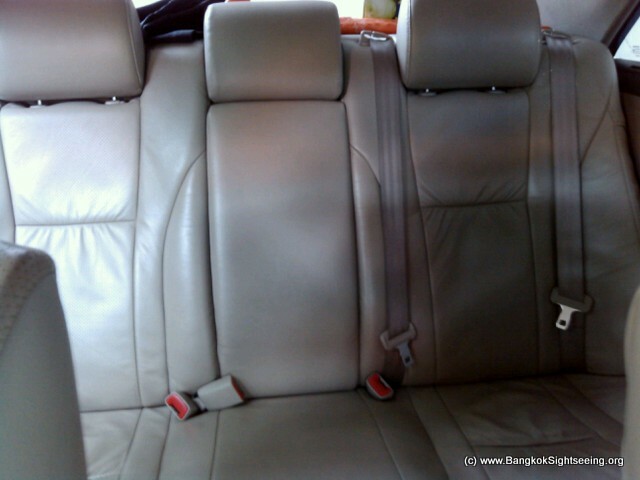 A one-way ride costs just around 120 Baht per person – but keep in mind that the vans are very crowded and they have fixed drop-off points, so if you value convenience it’s better to book a private transfer from Bangkok to Pattaya. 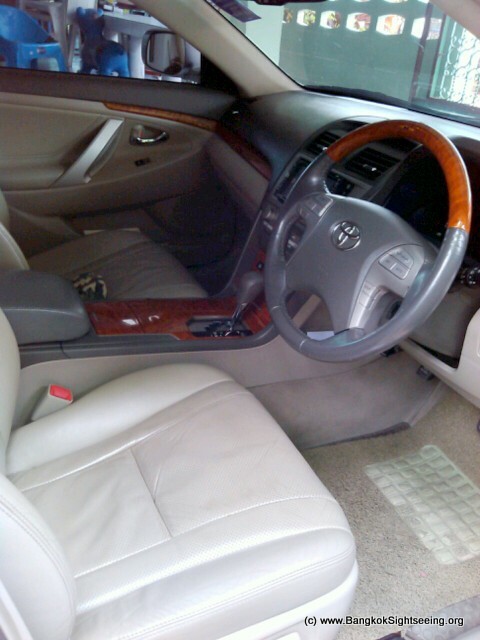 The transfer takes around 1,5 to 2 hours. 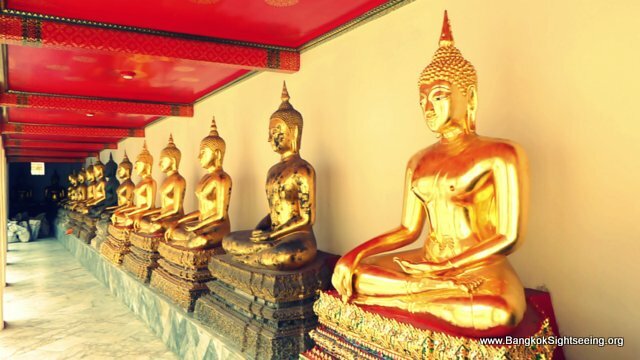 The Wat Po (วัดโพธิ์) temple in Bangkok, which also houses the reclining Buddha, is one of the most popular tourist attractions in Bangkok, and with good reason. It’s a large temple compound with many things to see and discover. This temple is actually older than Bangkok itself – however, it used to be a very small temple and got upgraded and expanded over time. 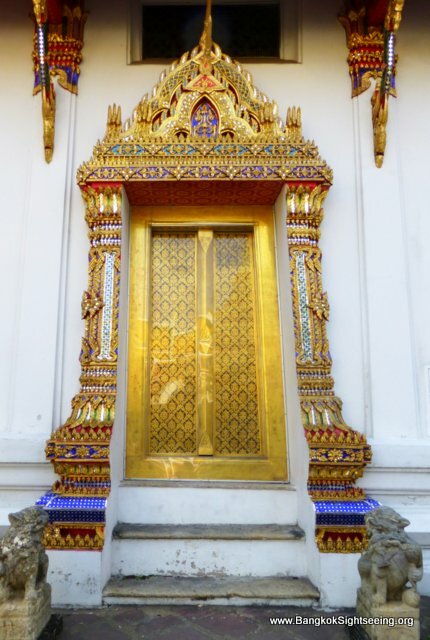 You’ll see many interesting things when you walk around the compound, like these skillfully designed doors which are entrances to buildings of the Wat Po. There are plenty of stone statues to be found also. 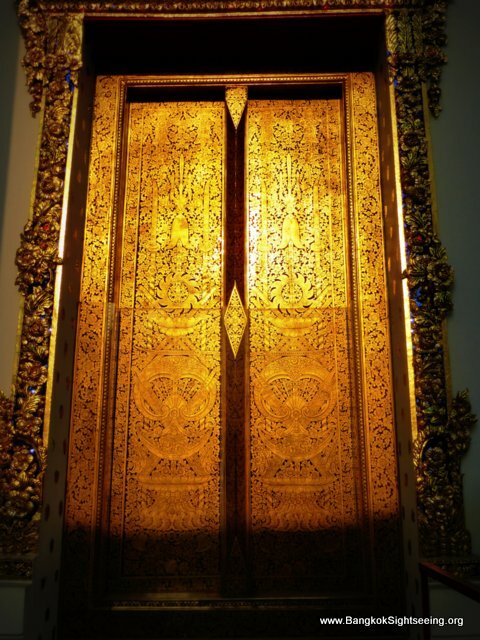 What’s funny about these Chinese giant door guardians is that they weren’t really made for this temple. Instead, Chinese vessels used them as ballast on the way from China to Thailand. 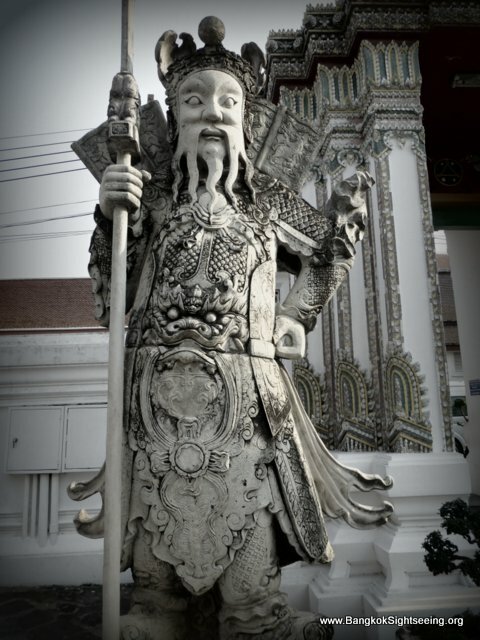 There was a lot of trade going on between these two nations hundreds of years ago, and the Chinese bought plenty of things from the Thai people, so when the ships went from Thailand back to China, they were heavy and fully loaded. 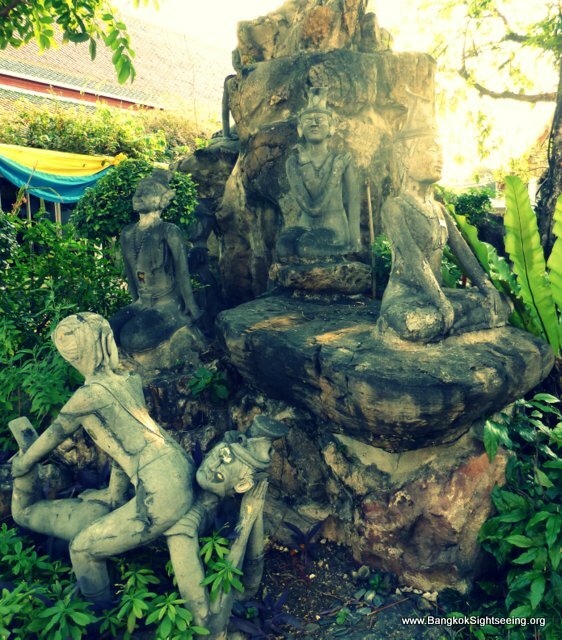 But when they went from China to Thailand, the merchandise was not heavy enough, and the ships needed some ballast – so they simply used these stone statues to make their ships heavier. Why the Chinese didn’t seem to value these statues isn’t known though. 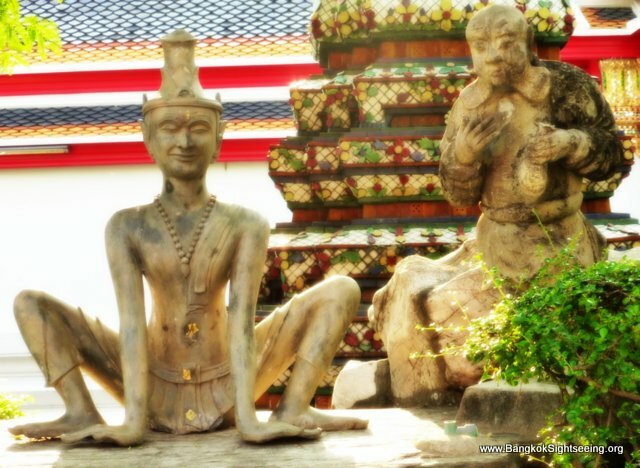 But maybe even more interesting are these statues of Thai hermits (called ruessi datton in Thai) which practice traditional Thai massage. After all, this is the most popular place to get an authentic Thai massage (also known as nuad boran in Thai), and there is a school for those who want to study Thai massage that offers both introductory courses which you can complete within a week, and more advanced long-term courses. These Thai hermits used to live in mountains and forests of Thailand long ago and practice meditation, and it’s believed that they used Thai massage and a kind of Thai yoga to keep physically fit and to balance out the hardships of sitting motionless for long periods of time in meditation. 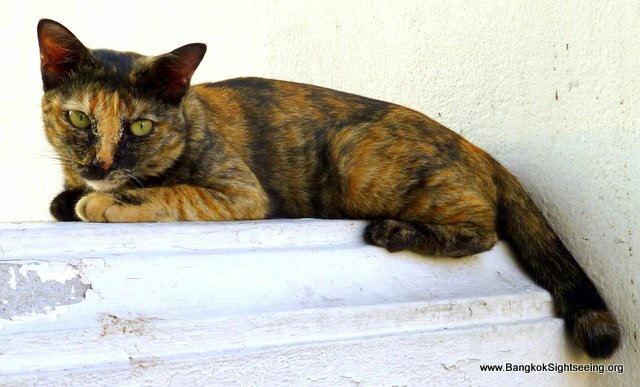 There are also books about the meanings and supposed effects of each Thai massage posture, but they aren’t very detailed, and this isn’t as well-researched as the Indian yoga. 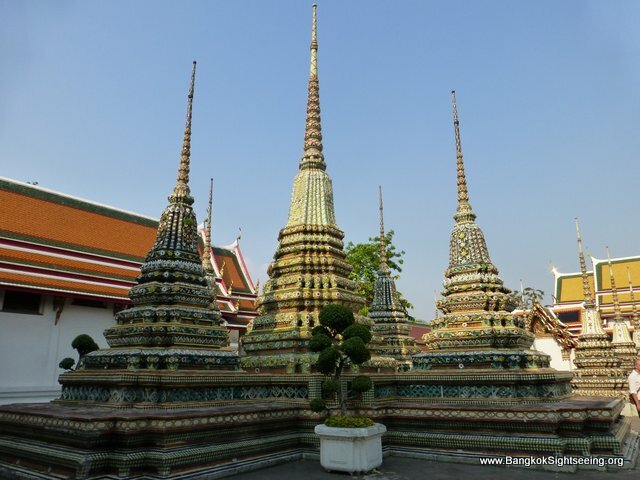 Then there are stupas on the compound, some which contain remains of previous Kings of Bangkok. There’s also a long row of Buddha statues in the subduing mara pose, which is probably the most popular Buddha posture in Thailand. 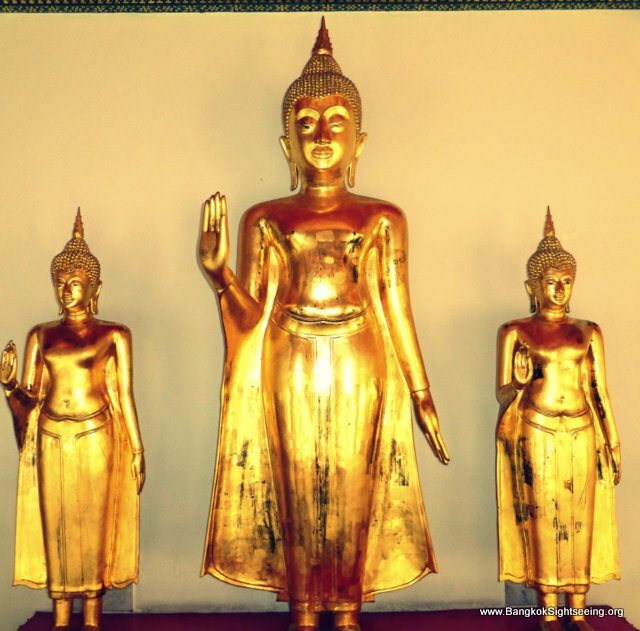 There are actually more than a thousand Buddha statues on the compound of the Wat Po temple. 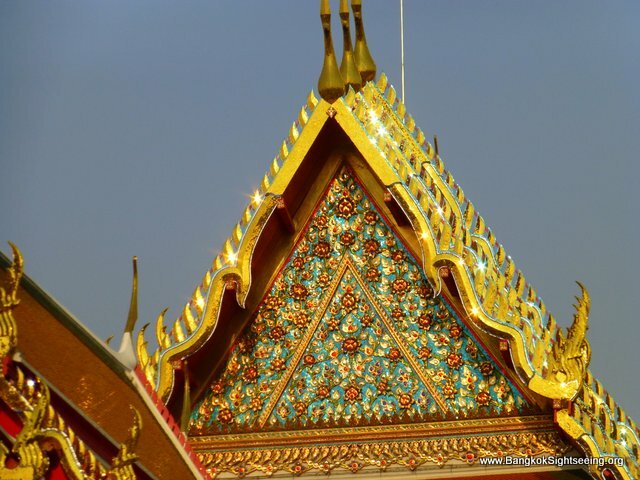 These shiny golden temple roofs gables with it’s colorful mosaic mirror decoration is quite spectacular when hit by sunlight, or even more – when shone on by strong lights at night, glistering majestically in the darkness. 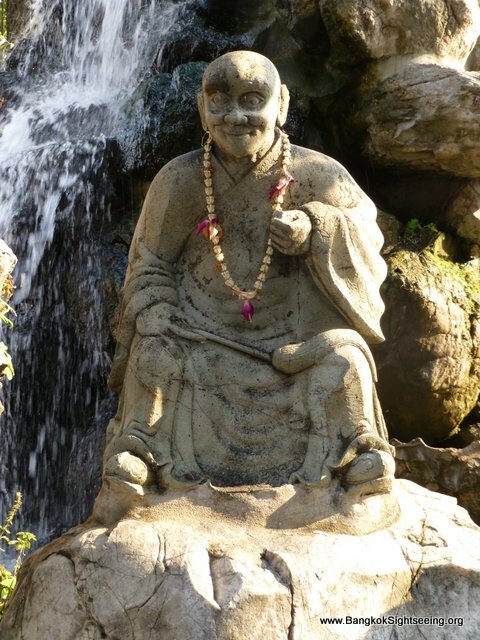 This Buddha statue represents peace, if you look at it you can see that it looks as if he is trying to stop something – and indeed, he is. He’s telling members of a family to stop fighting and quarreling. So if you like to visit the Wat Po temple in Bangkok as part of your Bangkok sightseeing activities, you can come here on your own, or if you want to learn a bit more about what the things you’ll see mean and the stories behind them, and how they fit into Thai culture and society and religion, you can hire a private tour guide or book a Bangkok day tour. By the way – the term Wat Po temple is kind of redundant, because wat is the Thai word for temple – but it’s common to use that name in English anyway, so it’s fine to use it. 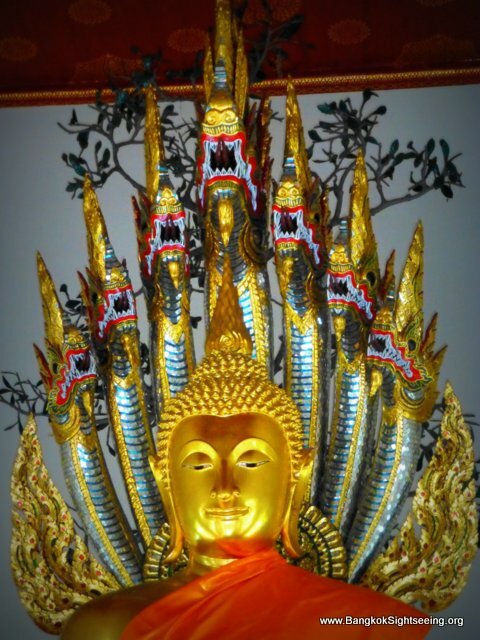 As many things in Thailand, there’s a long name for this temple too, which is Wat Phra Chettuphon Wimon Mangkhlaram Ratchaworamahawihan (วัดพระเชตุพนวิมลมังคลารามราชวรมหาวิหา), but almost no one calls it that way. 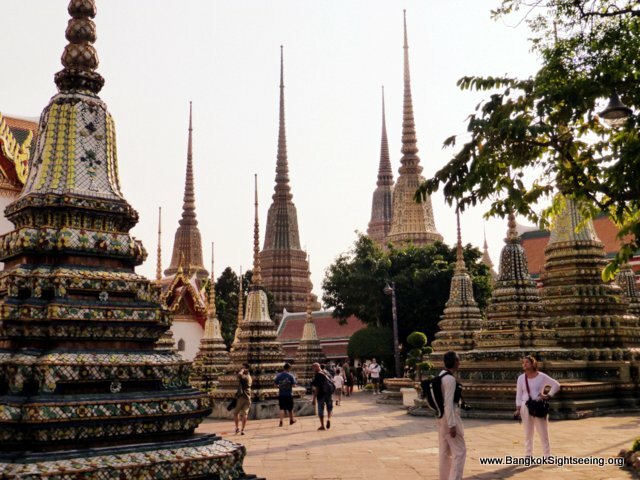 However, Wat Phra Chettuphon is quite a common expression still, and if you get on a taxi to get to Wat Po, and the driver doesn’t understand where you wanna go to, you can still try to say Wat Phra Chettuphon. Keep in mind that this is a huge temple compound, around 80,000 square meters, so you can take your time to walk around and explore – but it’s best to avoid the hot hours of midday if you plan on doing so. 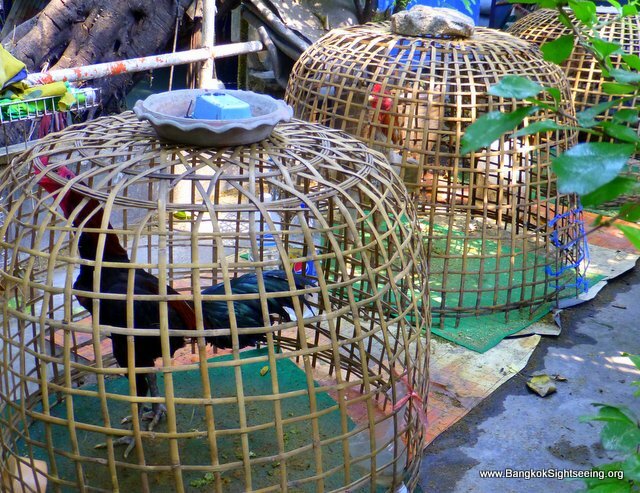 This is one of the absolute must-see attractions in Bangkok. 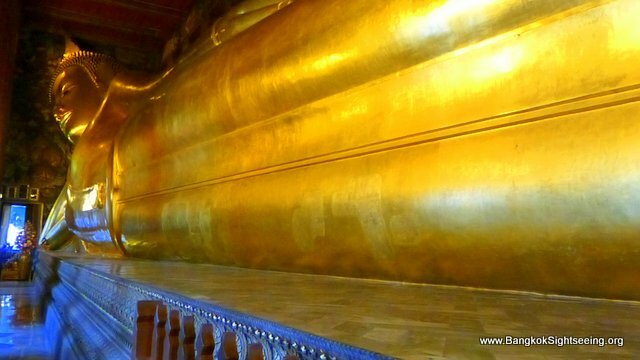 The famous reclining Buddha in Bangkok is located in the Wat Po temple. It’s so big that it’s really challenging to take a full-length picture of him – after all, fitting 43 meters in a single indoor-photograph is a bit challenging, and the only possible angle to accomplish this herculean task is when you’re standing at his feet. Speaking of his feet, they are interesting to look at too. 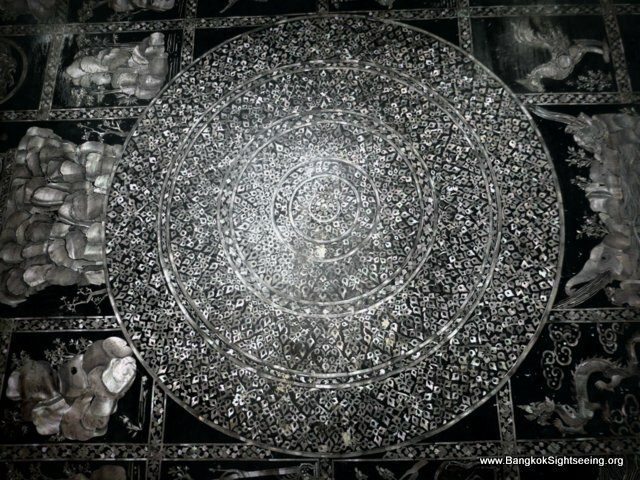 Intricate designs made from mother of pearl inlays that represent 108 auspicious characteristics of the Buddha. 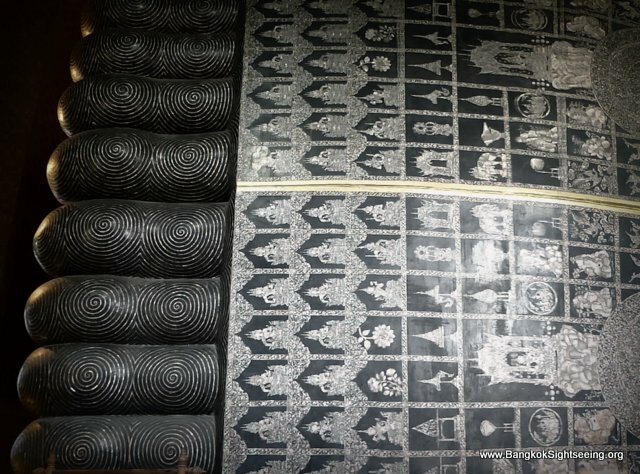 So when you go on a Bangkok sightseeing tour, just make sure to visit the Wat Po too – and keep in mind that when you enter the hall where the reclining Buddha is located, you gotta take off your shoes. You might want to bring a pair of socks, because on busy days so many tourists from all over the world walk around the hall that it can be quite stinky from all those sweaty feet, which is a shame, because if you manage to come here when there aren’t that many folks around, it’s a beautifully serene and peaceful atmosphere. 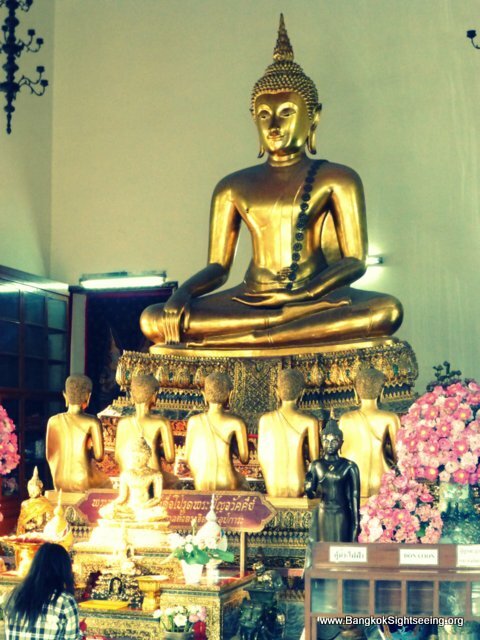 There are also plenty of smaller Buddha statues located around the large reclining Buddha, in different poses. This posture represents how the Buddha remained calm and kept his meditative state of mind even when both outer distractions where attempting to break his concentration. 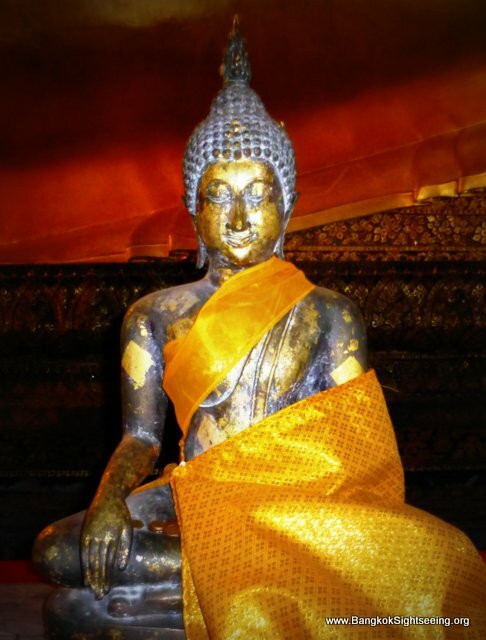 It’s in fact one of the most popular postures of the Buddha in Thailand. It’s also known as the Bhumisparsha posture, or Subduing Mara. Mara is the leader of the demons, and he tries to unsettle the Buddha with all the tricks, destractions and weapons he has at his disposal. While Mara let’s his army of demons proclaim his powers, Mara then demands that the Buddha proofs that he indeed is enlightened. How does Buddha respond to this? By simply touching the earth, upon which Mother Earth proclaims: “I am his witness.” That’s good enough for Mara, who then takes flight with his army of demons. 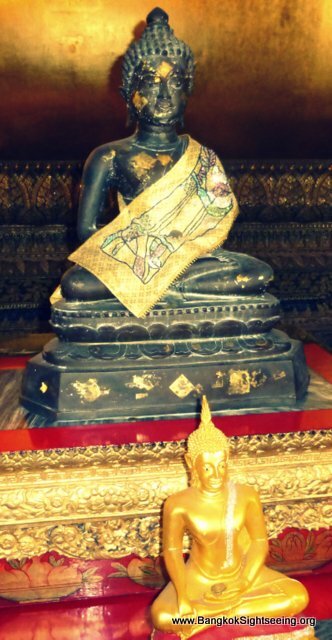 Many people think that it represents the Buddha “dying” (passing over into nirvana), but this is a mix up with a similar posture where his right arm is lying next to the body. 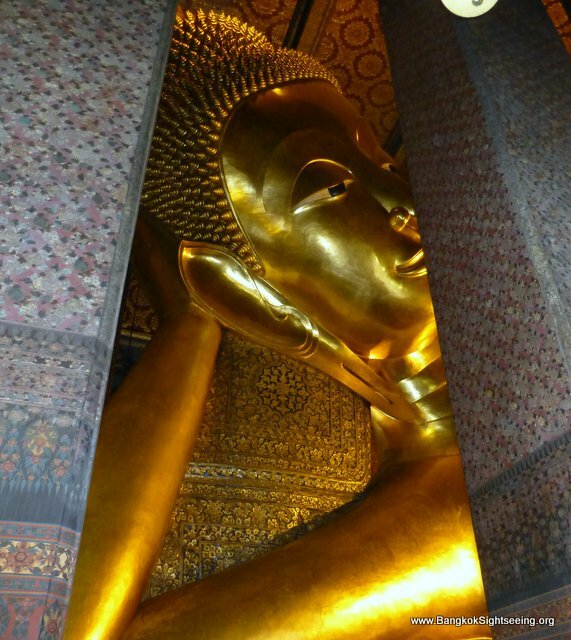 So this reclining Buddha image, where his head is rested on his right arm, simply represents that the Buddha is resting. The story behind this is that there was a giant, called Asurindarahu, who didn’t want to bow before the Buddha, because he doubted his greatness. The Buddha simply enlarged his body many times, until he was much larger than the giant Asurindarahu, and kept laying there in this relaxed manner. 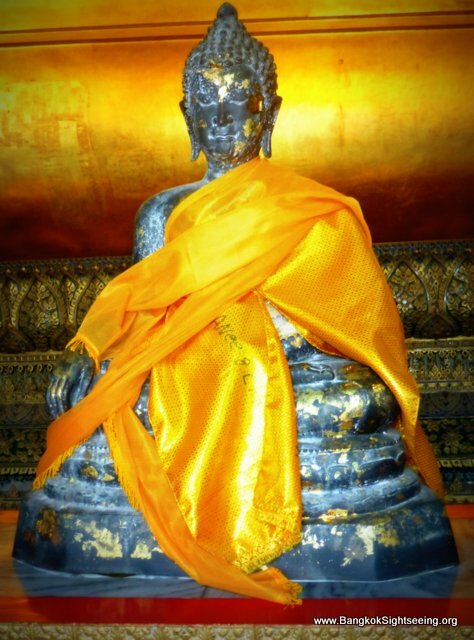 Asurindarahu then accepted that the Buddha was indeed great and powerful, and bowed before him. Keep in mind that stories like these are used as teaching vehicles. This one could represent a certain kind of humility towards spiritual teachers. There are some people who have a very high, and sometimes inflate, sense of self-importance. 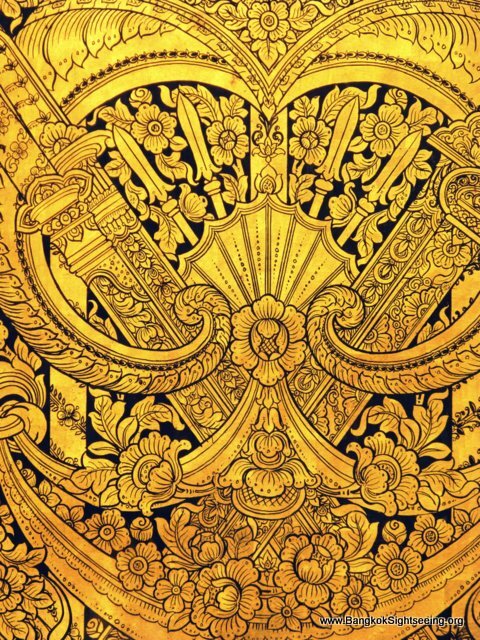 All these big shots who walk around and think they are better than others, and they might think that others don’t have anything to teach them or that they can’t learn anything from Buddhism since they’re already so great and awesome. So this effortless kind of demonstration of the greatness of the Buddha kind of represents that there is a different kind of greatness – and although I personally don’t believe this story to have happened this way, I think it’s a story that for a long time served as a good teaching tool to transmit knowledge and cultural values. 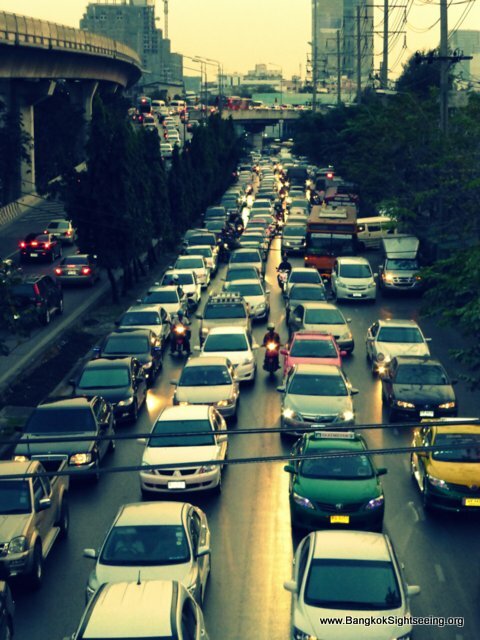 But if there is one reason visitors return again and again to Bangkok, it is the people. The anonymity and daily grind of urban life is slowly wearing away at the legendary Thai smile. 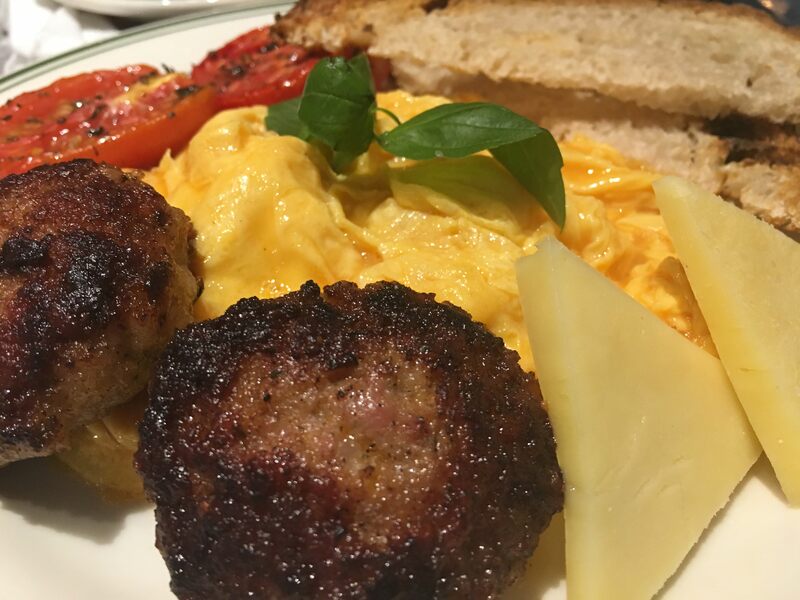 Yet Bangkok remains one of the friendliest cities on the planet, still infused with the Thai village traditions of hospitality and graciousness. 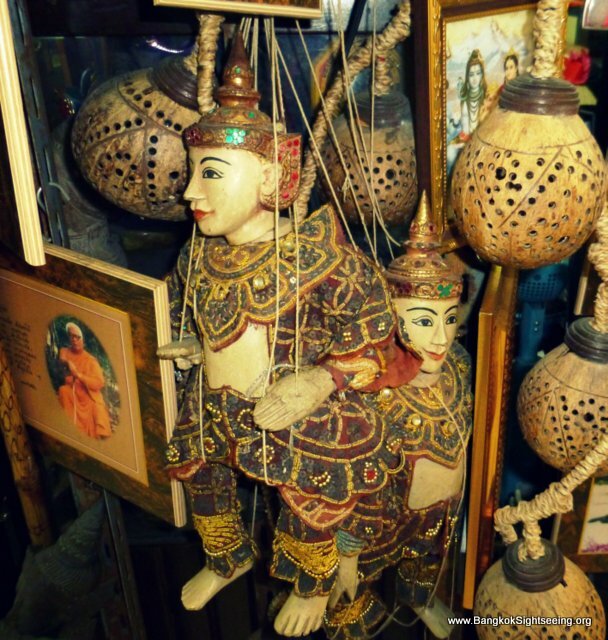 Thai people have some interesting puppets, and puppetry has for a long time been a popular form of entertainment in Thailand. With the advent of TV, cinema and radio however its popularity declined – until puppet master Joe Louis helped to advance it, and the now legendary Joe Louis puppet theatre in Bangkok is still doing daily shows. Believe it or not – but you can go sightseeing in Bangkok by bicycle. 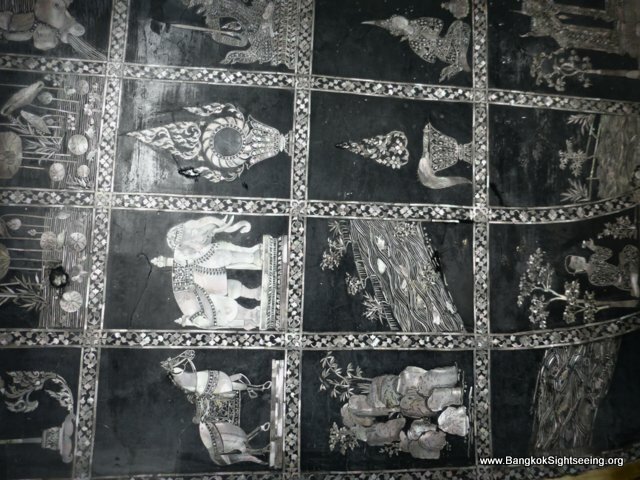 There are several Bangkok cycling tour companies that offer different themed tours for tourists, or you can just rent a cheap bike yourself and following along the Rattanakosin Biking Route, which will bring you around the historic city center of Bangkok. 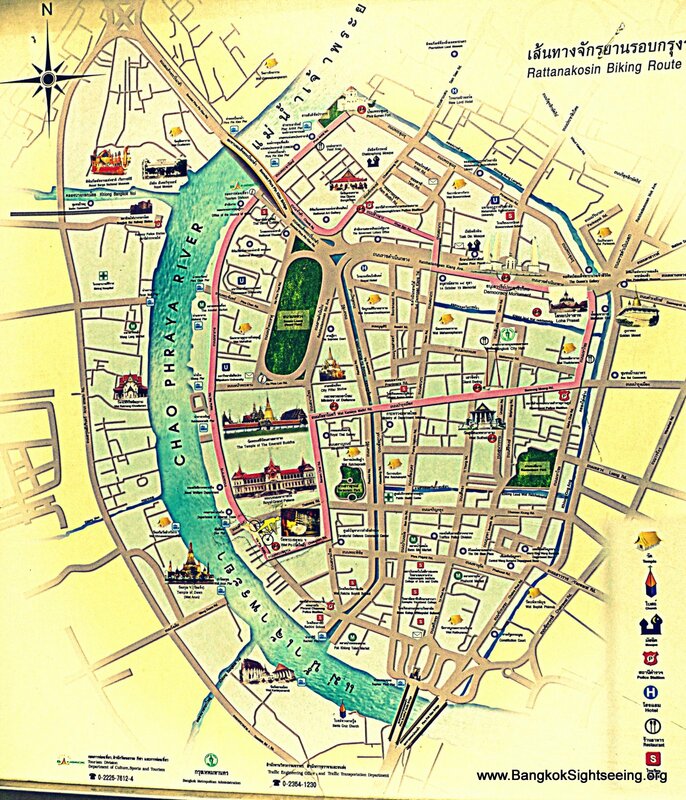 You can click on the image below for an enlarged version of the Rattanakosin Biking Route map.